SYNOPSIS: The dwarves, along with Bilbo Baggins and Gandalf the Grey, continue their quest to reclaim Erebor, their homeland, from Smaug. 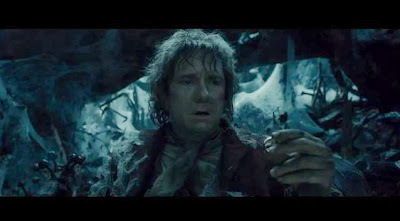 Bilbo Baggins is in possession of a mysterious and magical ring. REVIEW: Peter Jackson, director of the Lord of the Rings trilogy and The Lovely Bones, returns to the reins of the story that made Jackson such a premiere and acclaimed director of our time. Writers Fran Walsh, Philippa Boyens, and Jackson reunite to delve back into the world of J.R.R. Tolkien and the realms of Middle-Earth. Thorin Oakenshield (Richard Armitage), his dwarf company, Gandalf the Grey (Ian McKellen) and Bilbo Baggins (Martin Freeman) narrowly escape from an Orc ambush. Still being pursued, the company of dwarves, a hobbit, and a wizard make their way ever closer to the Lonely Mountain. On the road they travel through more Orc infested hills, the giant spider infested Mirkwood, elf guarded forests, and an ailing fishing town at the base of the Lonely Mountain under the keep of men. During their travels Gandolf the Gray must say goodbye to the company in order to prove his own worries of a darkness that may becoming back into the world. With the evils of Orcs, the threat of the dark Necromancer, isolated Elves, and the greed and sloth of Men, Oakenshield, Bilbo and the rest of the company of dwarves may never reach the secret passage to the Lonely Mountain in time to face Smaug the Dragon. 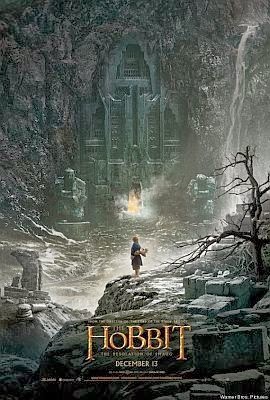 Picking up immediately after the end of The Hobbit: An Unexpected Journey, The Hobbit: The Desolation of Smaug serves as the heart of The Hobbit trilogy of films. Using the same formula as Peter Jackson's original Lord of the Rings trilogy, hobbits, dwarves and wizards spend much of their time running toward their final destination, being captured and imprisoned, fighting off all manner of evil menace, and dealing with close minded and isolationist kings and kingdoms. Most return to the second film, and some new characters are introduced or pulled from the The J.R.R. Tolkien source materials. Martin Freeman's Bilbo Baggins finds himself better prepared for the task of this adventure. He found something in the Goblin mines - namely his courage and an odd little ring. The company of dwarves, led by Thoren Oakenshield's Armitage, continue their venture as well looking more haggard and weary than Bilbo. McKellan's Gandalf is as enwizened and curious as ever, still able to wield a powerful staff and sword. Luke Evans plays Bard, a barge operator barely making a living in the small town of Laketown at the foot of the Lonely Mountain. Alan Cumberbatch lends his voice to the centuries old Smaug. Evangeline Liily is a new She-Elf name Tauriel, a captain of the guard of the Wood Elves. Orlando Bloom returns - for the first time - as Legolas the prince son of the Wood Elf king Thranduil (Lee Pace). Peter Jackson's second installment of The Hobbit is as epic as ever, coming in at two hours and 40 minutes. With impressive vistas and long rolling shots of the hills and dales of the world of Middle Earth, the tale seems to have lost some of its urgency and magic. WingNut worked overtime to create more elaborate and epic CGI sequences. From the extended escape in the barrels from the Wood Elves and Orcs to the elaborate and gorgeous rendering of Smaug in his stolen under mountain treasure vaults, most of the effects are wonderful. 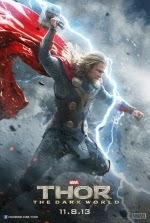 And while the effects get better the repetitive nature of the film's storyline makes some of the quieter moments stale. Tauriel walks a fine line of repeating some of the same work that Liv Tyler's Arwen did in LOTR: Fellowship of the Ring. Even Stephen Fry's Master of Laketown is in possession of a wormy servant name Alfrid (Ryan Gage) a la a certain pale apprentice to Saruman in LOTR: The Two Towers. Fans of the stories will appreciate all the love and care that Jackson, Walsh and Boyens put into The Hobbit. Newcomers to the franchise may be unprepared for the film's length or that it is the centerpiece of a three part single story. Beautiful and epic, Jackson makes fantasy as real as possible.